The video below comes after much study on the subject of when New Moon Day is. When one starts to study this subject, the scriptures do not seem to be clear initially as to which day is New Moon day, as there is no actual statement in the scriptures we have today which lays this out plainly. He tells us that we require at least two witnesses to establish something as a fact. When one steps back and views the scriptures as a whole, one finds that the scriptures do indeed show us when new Moon day is. The following video covers this subject. The following verses highlight how Yahuwah looks at light and darkness. We can see throughout the scriptures that Yahuwah Is Light and in Him there is no darkness at all. We know each day begins with LIGHT. Yahuwah has kept everything simple. So let’s keep this in mind when looking at this subject. If the day begins with LIGHT, so to do His months. The day starts with the sun becoming visible as its light is seen. The light becomes brighter and brighter until the whole sun can be seen. In the evening the sun drops below the horizon, and its light diminishes until there is no light left. The day is no longer. And Elohim said, Let there be LIGHTS in the firmament of the heaven to divide the day from the night; and let them (the lights) be for signs, and for appointed times, and for days, and years. Yahuwah tells us that He provides His lights for signs. But what is a Sign? A sign is something we see before the event takes place. It’s like a warning that you see when you are driving down the road. The sign (or warning) is placed before the event. In His word He also tells us these lights are for His appointed times. He continues to tell us that the lights provide us with the days (not nights). He tells us the Lights are used to determine the years. Each one of the purposes of the sun, the moon and the stars work by providing us with His light. None of them work without light for it was the light which He said would provide us with this information. So today How do we use the sun, the moon and the stars for His appointed times? Think for a moment…. How? You might say ..well the sun provides us with the day.. and I would agree. But have you ever thought how you know where in the world that day starts from? How do you use the sun, the moon and the stars to know when the days are to be counted from? That is the purpose of the Moon. The month is the start or the head of the days. Without the month one cannot know what day you are upon. The month marks this time and ALL days in His word are counted from the new moon. He has written about how His Sabbaths are a sign. The following verses list how the Sabbath is a sign clearly. 13 Speak thou also unto the children of Israel, saying, Verily my Sabbaths ye shall keep: for it a SIGN between me and you throughout your generations; that ye may know that I Yahuwah that doth sanctify you. 10 “Therefore I made them go out of the land of Egypt and brought them into the wilderness. 12 Moreover I also gave them My Sabbaths, to be a SIGN between them and Me, that they might know that I am Yahuwah who sanctifies them. Yahuwah told us that these SIGNS would provide us with his Sabbath days. In Deuteronomy 16:1 he also tells us to OBSERVE (H8104 – Shamar – to observe of watch for) the new Moon of Abib. To observe something it must be seen. Have you ever been in a dark room and not seen the edge of the bed frame and kicked your toe? Why did you kick your toe? Because you did not see the sign of the edge of the bed! A sign is given as a warning or a proof. A warning is given before an event. This way you will not kick your toe! Yahuwah said, Let there be Light …. Light comes from a luminary. In the same way when we observe the day, what does one use? The dark or the light? When one observes the months you do it the same way. You look for the light. The light is the warning or proof. One might say that there was darkness over the face of the earth first however? And yes, I would agree that there was darkness over the face of the earth to start with. So is this the start of what He calls a day in His word? In His word He called the light day. Once there was day He then and only then He called the darkness night. He did not call the darkness night until there was day. That is, if there was no day, there could be no night as night is the dark side of the day. In the scriptures, He also shows us New Moon day. He shows us the first, the second and third Sabbaths. It is these events He has placed His light upon that they may be seen. So what difference does that make? The fourth Sabbath does not have any light shone upon it. That does not imply that it does not exist, rather it is saying that the fourth Sabbath each month did not have light shone upon it. 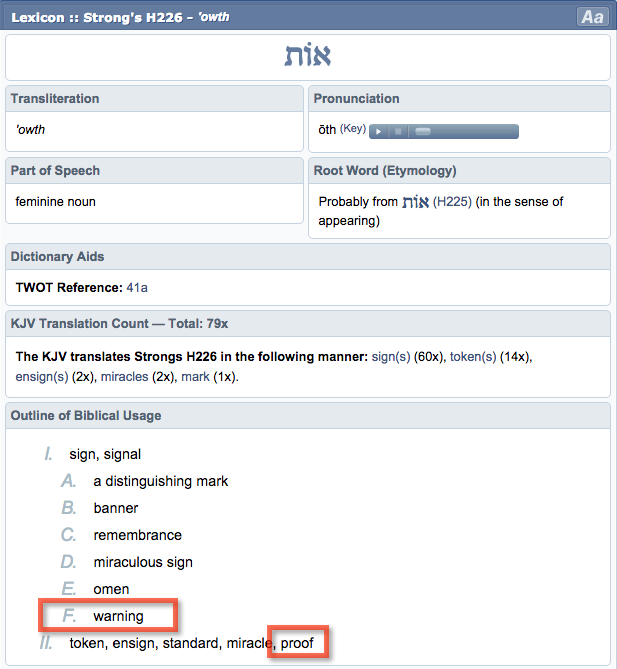 Is not the word of Yahuwah his Light? Have you ever considered How Yahuwah shows us something without showing it? We see this time and time again in His word. He even spoke it to the disciples, telling them that the light was given that they may see, but it was not given to all. If the scriptures are His light should we not look to see when His light is shone upon the examples He gives us in the scriptures? We see New Moon day in the scriptures. He places His light upon them. We see the first Sabbath in scripture. He places His light upon them. We also see the third Sabbath in the scriptures. But one thing is missing. There is no light shone upon it. The fourth Sabbath. Scripture, the word which is a lamp unto my feet, which lights the path never shows any light upon this Sabbath day. Following the full moon you place the day which we see the most light shone upon it, the 15th in darkness. Following conjunction you also place New Moon day, a day we are told much about, in darkness. Does not the day begin with His Light? His Months are the same for otherwise it would be confusion. The following are some scriptures which are useful on this subject. 7 From the moon is the sign of the appointed times, a light that decreaseth in her perfection. 8 The month is called after her name (Moon), increasing wonderfully in her changing, being an instrument of the armies above, shining in the firmament of heaven. 17 For Yahuwah did not send His Son into the world to condemn the world, but that the world through Him might be saved. 18 “He who believes in Him is not condemned; but he who does not believe is condemned already, because he has not believed in the name of the only begotten Son of Yahuwah. This is the message we have heard from him and proclaim to you, that Yahuwah is light, and in him is no darkness at all. If we say we have fellowship with him while we walk in darkness, we lie and do not practice the truth. But if we walk in the light, as he is in the light, we have fellowship with one another, and the blood of Yahushua his Son cleanses us from all sin. 10 But if anyone walks in the night, he stumbles, because the light is not in him. 35 Then Yahushua told them, “You are going to have the light just a little while longer. Walk while you have the light, before darkness overtakes you. Whoever walks in the dark does not know where they are going. 20 To the law and to the testimony! If they do not speak according to this word,it is because there is no light in them. The following are some quotes which are useful on this subject. (Judaism, by George Foot Moore, professor of the history of religion, Harvard, vol 2, p. 22). (Postponements: Another Mystery of the Ages). “Up until the year 359 the arrival of the New Moon was announced by the Sanhedrin each month, based on the testimony of two eyewitnesses who appeared before the Sanhedrin and were questioned about the crescent of the New Moon that they reported having observed. If the Sanhedrin was satisfied with the integrity of the witnesses and their testimony, it then checked the testimony against its own (secret) calculations, which had been worked out in advance using mathematical and astrological knowledge. If everything harmonised, 61 the Sanhedrin would send torch signals from mountaintop to mountaintop to notify all communities that the New Moon had officially been sighted. . . . When the Romans who ruled Palestine had begun to deny the Patriarch some of the freedom he and his court had enjoyed for many years, and the situation had become generally grave for the Jewish community in Palestine, Hillel II decided to publish the calendar for distribution to all communities. By this action, the official day(s) of Rosh Chodesh (beginning of the new month) and each of the Jewish holidays was fixed; the testimony of witnesses was no longer required (p.9-10). (article, “New Moon,” p. 522, Hasting’s Dictionary of the Bible ). The following sites provide some witnesses as to the day of the New Moon as well. Isaiah 1:14 My being hates your New Moons and your appointed times, they are a trouble to Me, I am weary of bearing them. Isaiah 47: 13 You are exhausted by your many counsels; let the astrologers, the stargazers and those who prognosticate by the new moons stand up and save you from what is coming upon you. Sabbaths, even all her appointed times, to cease. Amos 5:21 I have hated, I have despised your festivals and I am not pleased with your assemblies. the sun or to the moon or to any of the host of the heavens, which I have not commanded. Nowhere in scripture are we commanded or given instructions to formulate or follow a lunar calendar. The verses you have pointed out are all to do with the apostasy of Israel. Israel left YHWH for another. They stopped following Him. It is a lack of understanding that you see, not the wrong calendar. Yes He is telling those who are supposed to be His chosen people they are in Sodom! It is who they are worshipping here that is the problem. Not when. YHWH hates their new Moon festivals and Sabbaths (Oh yes. He just said Sabbaths!). 13 “You are wearied by your many counsels. He never told us to predict when the new Moon would be. He told us to watch. Again. They are no longer worshipping Him, but are worshipping Baal. those forty years in the wilderness, O house of Israel? Again. They are no longer worshipping Him, but are worshipping Sukuth and Kaiwan. And again. They are off worshiping other gods in the sun moon and stars!! He never commandmed us to worship these things. He told us to USE them for His appointed times, not worship them. There is a HUGE difference. One is idolatry. The other is using the signs as a watch to know the time. You need to look at when they held their Sabbath days. they were always upon the 8th, 15th, 22nd and 20th days, and they were not worshipping these items but using them for His appointed times and worshipping YHWH, not Baal, or the sun. or the moon. Using a solar only calendar, you ignore the appointed times which He set in the sky for us, instead opting to use your own man made appointed times. shalom, are you following the wlc calender and your new moon day is it dark or at the 1st crescent of the moon? I follow the day after the first visible crescent as new moon day. The reason I do it this way is that is what I “see” with the light in scripture. 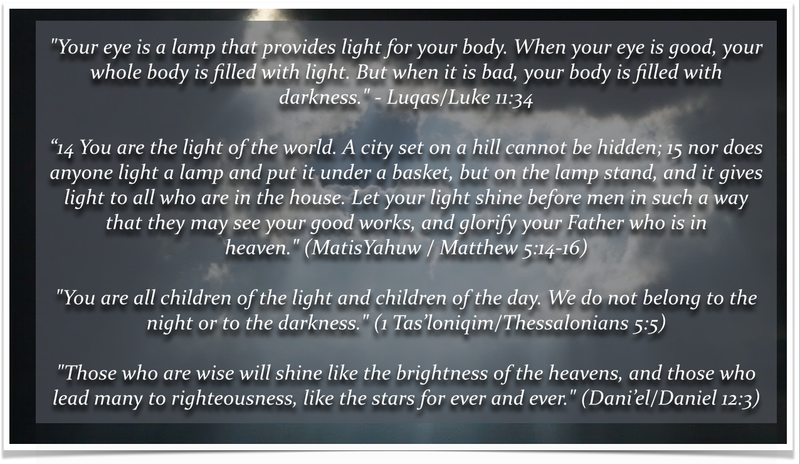 Have a look yourself for where the Light is in Scripture. You will see that there is light upon New Moon day, the first, second and third Sabbaths in His word. There is no Light on the last Sabbath. It is hidden. It covers the reasons why I follow His appointed times this way.